Saké Nomi is a place to learn about and explore premium Japanese saké, and its brewing culture and traditions, in a convivial, welcoming environment. At Saké Nomi, we believe learning about saké culture and traditions can deepen one’s appreciation of this delicious, complex beverage. Saké Nomi is a place where saké enthusiasts (as opposed to “experts”) can gather to share their curiosity and passion for this wonderful beverage and its culture. We call these enthusiasts our nomidachi (Japanese slang for “drinking buddy”), and we want them to feel Saké Nomi is their unique place to be for all things related to saké. At Saké Nomi, we encourage a “give and take” atmosphere where those with more saké-related experience can share their knowledge with newcomers. For saké “rookies” new to the beverage, there’s no need to be timid or afraid – Saké Nomi is the friendly, welcoming environment in which we can all increase our saké knowledge and enjoyment together! 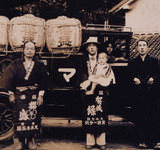 To raise general saké awareness, Saké Nomi conducts monthly seminars and special tastings to introduce various saké topics and unique brewing styles. Traditionally, sake was brewed only in the winter. At Saké Nomi, we view this situation as an opportunity to create a uniquely American (specifically, Seattle), East-meets-West atmosphere. We honor the traditions and craftsmanship of Japan’s skilled saké brewers by carrying the Northwest’s widest selection of imported and handcrafted premium saké, and we reference the traditional architecture of the Japanese sakagura (brewery), in Saké Nomi’s interior design. At the same time, we also feature modern saké-related accessories exclusively designed for Saké Nomi by Seattle-based artists, and we provide a unique atmosphere in which to “test drive” several saké selections on rotation at our tasting bar. We strive to make Saké Nomi a comfortable, casual saké “museum,” where you can learn about and experience a wide variety of different saké and the regions in which they are produced, and maybe make a few new nomidachi along the way . . .
Saké Nomi’s free newsletter, Nomidachi News, contains informative saké-related articles, as well as news about upcoming events and special promotions..
Tuesday - Saturday: 2 - 10 p.m.
Sunday: 2 - 6 p.m.
iBleedPixels Hand-crafted in Kochi City, Kochi Japan.